Fall Registration Starts June 1st, 2019 for Members*, and July 15th for Non-Members! Every year we reward all of our students by putting together an unforgettable exhibition. Every student will show their family what they have learned all year. Parents take pictures while their child receives a microphone introduction and an award with a certificate. This years theme is “The Greatest Show on Earth”! Don’t forget to register, Deadline is April 18th! Can’t wait to see you all there! An event you won’t want to miss…..Ninja Games 8/24/2019! Unmask Your Inner NINJA at NINJA GAMES 2019! 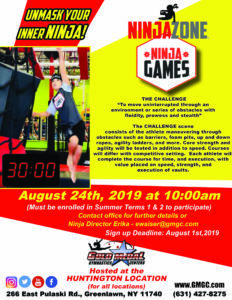 Ninja Games will be hosted at our Huntington location August 24th, 2019 at 10:00am. Ask your location for details. Check out our Summer Class & Camp Activity Schedules!! You can find these schedules in our Printouts section.